Google have launched Gmail and it has lots of new features (like Search bars and easy tagging). 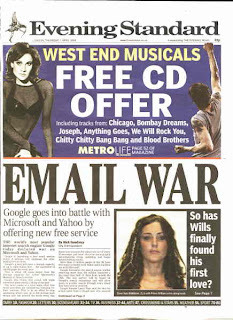 It's a direct attack on the dominance of Hotmail and Yahoo mail with the key advantage about free space - Gmail offers massive storage for free ('Google gave me a Gig'), whereas the Yahoo / Microsoft rivals all charge for anything above the basic limits. Google will also be serving contextually relevant text ads alongside emails and this has the potential to significantly extend Google's Adwords reach. Clearly there are privacy concerns around this, but whatever happens, Googles announcement of Gmail will shake up the free email landscape!